Santa Pod " Main Event"
But our season didn't start the way we hoped. After the damage we had at Easter our engine needed to be repaired but it wasn't ready in time for the first round. Graham Ellis had a spare engine and he wanted us to use it during the main event, we also got some pistons and rods from Dan Larsen. The engine was installed and we were ready for some testing. On Thursday we did two testruns, 60ft times looked great. Everything was looking good for qualifying on Saturday. On Friday our engine arrived at Santa Pod. On Saturday there was no qualifying due to the rain and so we decided to replace the engine. The team worked late to resolve some problems. The first run was planned to be a half pass. 0,99 to sixty feet for Danny and off the throttle at 200 meters. But when the car was back in the pit we discovered again engine damage. And so after 1 run the weekend was over for us. Back home we have to check the whole car and think about how to continue with this season. 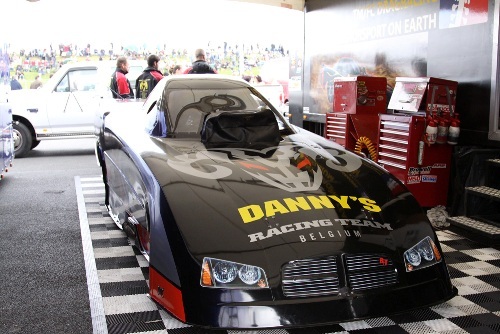 We would like to thank our sponsors Speedshop Belgium, Marcover, Rico Tools, Iso-Mobile, Capricorn and De Klussenier. Also big thanks to Graham and Dan for getting us the parts to race....and Jaap and Jan Selles to make it possible..